Of all the gift guides I've put together this holiday season, I think this is my favorite one of all. And that's really saying something because I've done a lot of guides in the past few weeks. I love this one because if I'm being honest, I rarely spend too much more than $50 on a single present for anyone during the holidays. I love finding ways to delight my friends and family without depleting my savings. In my 'Nostalgia' gift guide I included quite a few games. I love them because they make for a great intersection of "a gift you can actually unwrap" and an "experiential gift" which almost always goes over well. The game gift encourages quality hang time, and can often spark really interesting conversations, too. A 2-deck set of personalized playing cards is great for parents who love bridge or getting together with your cousins for a big game of Spoons. (Or King's Cup, naturally.) Also in the mix above are a couple of fun card games from The School of Life; What Should I Do With My Life and The Confessions Game. No surprise here, but gifts that upgrade the bar or invite a shared cocktail are always a great idea. They work as host or hostess gifts, stocking stuffers and I'll be honest, there's nothing wrong with wrapping up a bottle of Four Roses and putting it under the tree. Bundle it up with a cool pair of brass shot glasses and you'll be bonding with Dad in no time. Or, for serious cocktailing (and New Year's Eve! ), a set of four customized bitters flavors from Bespoke Post. Another awesome *little* gift that's great for all your holiday parties is a set of chic cocktail napkins from Chicos—yes, Chicos! 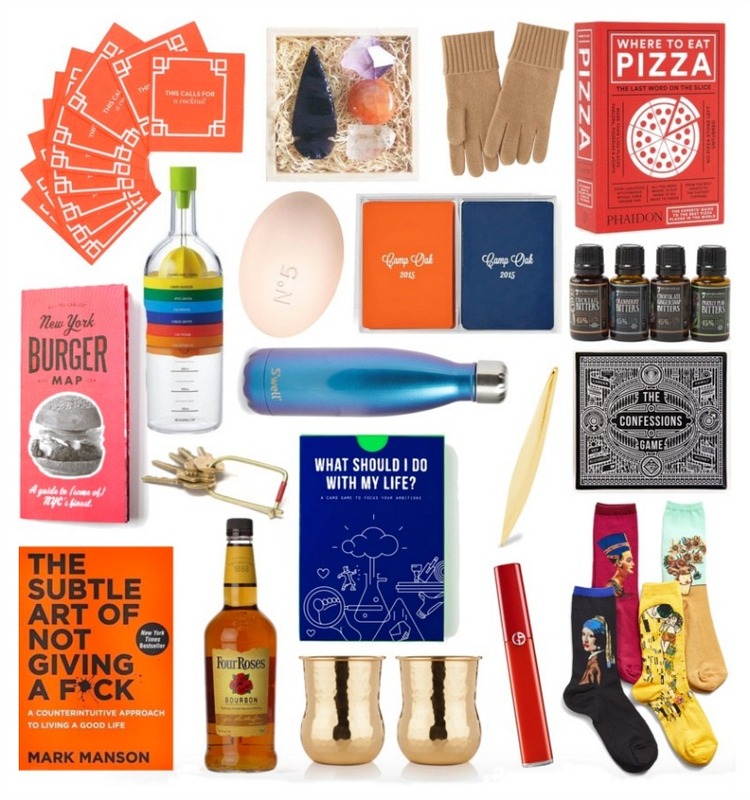 Browse a bunch more fun bar gifts under $50! The thing about beauty gifts is that in order for them to really land, they should be something that the receiver might never purchase for themselves. For example, Chanel soap! Also consider a super luxe lip gloss or stain, like Giorgio Armani's Lip Maestro. If you have a friend or relative who's also into feeling beautiful from the inside out—consider a bouquet of crystals with a specific energy, like Little Box of Rocks 'Warrior' bouquet (for strength!). Ah, the wildcard category! There are so many fun and giftable things out there that I found, which couldn't exactly be grouped together. Like socks with famous works of art on them, Mark Maron's book, a map of where to eat burgers in New York that's just $8 and the IllumiBowl toilet night light. I know it sounds insane, but this thing is actually so clever and makes a hilarious gift. Even better? It's just $17. Also, everyone loves cashmere gloves that are just $30 and your chic girlfriends will appreciate a single gold earring from Catbird. More ideas still? How about personalized stationary from a small business like my friends Laura Palmer and Inslee. Here is great blog about writing research paper.